If you are interested in bringing your fishing adventure to the next level, then you might want to go fishing in a kayak or small boat. It’s much fun, trust me. Moreover, of course, you need the best portable fish finders for kayaks that will do the trick for your fishing adventure. 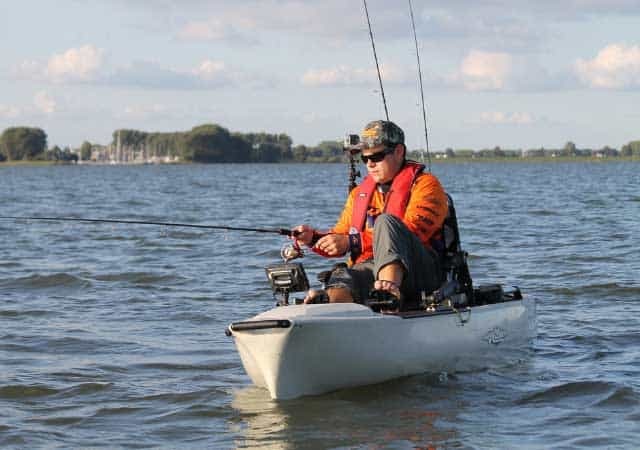 While you can certainly go out to the open waters using your kayak or small boat to fish, doing so without proper preparation may yield fewer results. On the other hand, with the use of a good portable depth finder, you can expect the best experiences during your next fishing trip, and you will never be disappointed at that. However, with the number of options that are currently available on the market these days, finding the best option may be challenging. As such, we have come up with the top 5 portable fish finder reviews so that you can quickly make a comparison among the options available. Take note of their advantages and disadvantages, and make a well-informed decision afterward. The Echo 551dv fishfinder is an elite member of the renowned Garmin family. It comes equipped with several advanced features which are all designed to bring your fishing experience a notch higher. For example, it comes fitted with an all-in-one transducer which offers both conventional broadband sonar and down imaging. Also, the display of this model provides high image quality, which can be viewed simultaneously either horizontally or vertically. While the Echo 551dv could have done better with a chart plotting or a GPS on it, its other advanced features make up for the loss, such as its photo like images of the sonar readings. The sonar of this model is quite amazing in separating the target from the bottom structure. In fact, the DownVu scanning offers some great photo like images of the fish and structure situated beneath the boat. Among the features that are well loved about this model is its ultra scroll function. It is used in targeting fish arches even when the boat is at high speed. It also has a bottom lock, which displays returns starting from the bottom up, while revealing the bottom always. The Deeper Smart Portable Fish Locator is a castable, wireless echo sounder. It is very convenient to use as it can be cast to any area on the water. It easily floats on the water surface, transmitting details of the bottom. With its Bluetooth connection, the distance between the user and the device is secured. As such, it is ideal for casting at short distances, such as when doing ice fishing or canal fishing. The only drawback to this fish locator is that it is not compatible with all phones and tablets. Therefore, it is recommended that before getting one, you have to check whether or not it works well with the model of your phone or tablet. Half of the device is made of your tablet or smartphone. You just have to download the Deeper App to run a simulation, examining how the devices work. You just have to pair it with the device and you are good to go. The App is compatible with most Android and iOS devices. It also operates in both online and offline modes, giving you other amazing features including Fishing Notes, Solunar Forecast Calendar, Offline Maps, Weather Forecast, and more. The Vexilar SonarPhone fish detector is one that does not come with a controller or display. However, you can use your tablet or phone as your screen. This means that it is relatively affordable compared to other options while maintaining the quality of fish finding capabilities. The setup process is very easy, as you can connect with the different elements of this model while using the display on your device. The software is currently available for both Android and iOS platforms, offering several features needed for fishing. You need to install the app on your mobile device. The app is free for downloading, with easy instructions for setup. Through the display of your devices, you can also alter the transducer settings depending on the location and weather conditions. The Fishin Buddy model from Humminbird is one that is very portable. This means that it does not have any pesky wires to use for plugging in and untangling. You do not have to deal with mounting brackets or transducers that you need to mount on your kayak carefully. Even though it is a portable unit, the fish finder’s 4-inch screen is big enough to display all details that you need. It is also equipped with an amazing color palette which makes reading all information better. One issue about this product, however, is that it may take longer to register readings, considering that it is portable. However, this is just minor, and when you get through the first readings, the rest follows. The sonar of this unit can par with other impressive models out there. For example, it operates at both 200 kHz and 455 kHz depending on the mode that you choose. It also runs using 6 AA batteries. With this power, you can use the device for about 25 to 30 hours. If affordability combined with performance is what you are looking for, Signstek FF-003 is the best option available. This device comes with a display which may be read both in the darkness of the night or in direct sunlight. It is easy to use, which means, it is ideal even for beginners or first timers in the world of fish finders and locators. This model starts receiving data automatically at the very moment power is turned on. Also, its sonar sensor should be cast from the boat, and your device is now ready for use. As an option under the Affordable category, some advanced features are lacking in this model. However, if you just need the basic ones, you have it all here. If you are searching for an affordable handheld fish finder that offers accurate readings while finding fishes, the Signstek FF-003 is a good choice. With its 100-level sensitivity setting, as well as multi levels depth range, there is a huge chance to locate fishes beneath your boat. You have the option to purchase fixed locators, as there are also several options out there available today. However, they are more expensive compared to portable options. Since you do not have to install a permanent setup for your fish finder, you can expect ease of use using a portable fish finder. It is very easy to setup, and can be used anytime you need it. These portable sonar fish finders can be transported easily from one place to another. They can even be used in a variety of locations. Whether you are only renting a kayak, small boat, or own a bigger watercraft option, a portable fish finder with gps will always be there for you. The flexibility introduced by the transducer makes a portable fish detector even more convenient to use. It can easily be thrown into the water, or it can easily be mounted into your watercraft. As suggested by its name, a portable fish finder can help you in finding fishes. Therefore, you can be assured that you are not just floating on the open sea waiting for nothing, but you are given a real glimpse as to what you can expect during your trip. Now you finally have a transducer in your hands, and all you need to do at this point is to mount it on a kayak. As a beginner, you may find the process of setting it up quite challenging. However, there are four very easy ways in which it can be done. Open your kayak hatch and select a flat spot on the hull where you can mount your transducer. Clean the area with alcohol, making sure that it is free from grime, dust, or debris. Stick the transducer, using a pool noodle. Apply silicon, or marine goop similar to the size of the transducer. Afterward, place the transducer on the goop securely. Run the cable through the hole, using a watertight fitting afterward to bring the wire outside. At the back part of your kayak, select an area that is flat, and Mount a plastic or metal plate. The plate should be around 3 inches in width, and shorter compared to the size of your kayak. Create a makeshift transom. In this way, if your watercraft hits a rock, your transducer will be protected. Run the wire through the top part of the kayak. This method is considered as an innovation by many. It allows you to do a DIY project. Prepare a PVC pipe which is of the same size as the scupper hole (typically ¾ inch). Mount the transducer on the PVC pipe, making a dot lined with the hole on the mount. Drill hole right through the pipe. Cut about ½ in in-depth on the shaft sides. Fit your transducer into the area that was cut-off, ensuring that the wires are already run through the pipe, sticking to the top. Stick your pipe right through the scupper hole. This method is easily the most convenient. While it may be more expensive, considering that it is a kit, you have everything that you need to start out. It already includes a battery, which can be secured using bungee cords on the kayak. The transducer can be mounted anywhere using the suction cup. Regardless of the option that you plan to use, make sure that the transducer is mounted accordingly. It should fit well, or else you might encounter the tendency of your transducer falling into the water. This applies when playing with the electronic settings of your fish finder. At times, the filters may do much assuming, which can give false returns. Therefore, stick to a setting that works for you, and learn gradually. If it is your first time using a fish finder, you might end up overwhelmed with the graph and details that you need to get familiar with. However, work on familiarizing school formations first, and everything will follow. After reading the portable fish finder reviews, you are now equipped with the right amount of information in order to make the best choice in selecting a best portable fish finder. However, if you notice, the items in the list provided above vary when it comes to features. If you are a beginner in this field and want to have the best kayak fish finder that can be connected to your mobile device, then the Humminbird Fishin Buddy is a recommended choice for you. However, if you are interested in taking advantage of advanced features, Garmin Echo 551dv Worldwide with Transducer no doubt the best option out there!